The Eurovision Song Contest's lofty goal is to unite nations through an annual festival of music - to prove that pop can conquer politics and bring people together. It has got its work cut out this year, though, with two of the participants: Ukraine and Russia. Ukraine - the 2017 host - accuses Moscow of arming separatist rebels in the Donbas region of eastern Ukraine. The conflict there has claimed 10,000 lives in nearly three years. Russia accuses Ukrainian forces of targeting civilians in the Donbas. Then there is the issue of Crimea: Moscow annexed the peninsula from Ukraine in 2014. Amid continuing violence in eastern Ukraine, there have been calls in Russia to boycott Kiev's Eurovision extravaganza in May. This week Russian MP Vitaly Milonov urged the head of Russia's Channel One TV to pull out of the competition. "The reality is that we will be unwelcome guests in a country seized by fanatics, who dream of destroying all the good between the Russian and Ukrainian peoples," he wrote. Channel One has yet to respond. In an interview with the BBC, Mr Milonov claimed that "many Russians" backed his call. He accused the Ukrainian authorities of supporting "right-wing fascist bandits" and proposed renaming Eurovision in Kiev "Reich-vision". Mr Milonov suggested that supporting Eurovision there would be "the same as supporting the fascist Olympic Games of 1936 in Berlin". The MP received support from fellow-parliamentarian and veteran variety singer Iosif Kobzon. Kobzon, sometimes referred to as "Russia's Frank Sinatra", told the Tass news agency: "I'm categorically opposed to performing in front of an audience that will spread Russophobia. "We must ignore this festival. It's taking place in a country which is killing people in the Donbas." Comments like these have sparked indignation in Ukraine. "Such aggressive rhetoric from the Russian authorities is strange," says Ukrainian MP Olga Chervakova, deputy head of the Ukrainian parliament's Committee on Freedom of Speech. "On the other hand, it is logical. For some time now Russian officials have been boycotting many things: in the UN Security Council, Russia has been boycotting common sense, in Crimea and the Donbas, Russia has been boycotting international agreements, while at home [with anti-EU sanctions] it's boycotting Swiss cheese." Ukraine is hosting the 2017 contest following Jamala's victory in last year's Eurovision with the song 1944. It told the harrowing story of Joseph Stalin's Soviet-era mass deportation of the Crimean Tatars, during World War Two. In Russia it is not only politicians who are calling for a boycott. Last month pop star Philipp Kirkorov said he saw "no point" in Russia participating in Eurovision. Kirkorov co-wrote last year's Russian Eurovision entry, which took third place: he alleged that political voting by Eurovision juries had deprived his country of victory. "I wouldn't send anyone," Kirkorov told Life TV. "I'm deeply disillusioned by how politicised and biased the contest has become." The Kremlin appears to be hedging its bets. "It's not clear whether we need to boycott," President Vladimir Putin's spokesman Dmitry Peskov told the BBC. "Of course, considering where this competition is taking place, and the possible problems with security and unfriendly attitudes, there is an obvious cause for concern. But, as far as we know, no decision has been taken." Ukrainian MP Olga Chervakova dismisses suggestions that Russians travelling to Eurovision in Kiev would be putting themselves in danger. "If anyone should be frightened, it's the Ukrainians," Ms Chervakova told me by telephone. "We know how Russian citizens are affected by aggressive anti-Ukrainian propaganda. Yes, we are involved in a conflict with the Russian authorities. We call Russia an aggressor. But we can separate the Russian authorities from ordinary Russian citizens. They have nothing to fear." 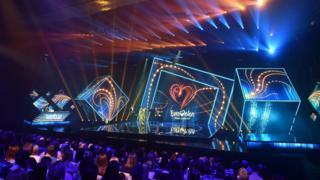 In a statement, the European Broadcasting Union, which organises the contest, said: "The EBU has been given no reason to believe that the Russian Delegation will no longer be taking part in the Eurovision Song Contest 2017, and look forward to hearing who Channel One have selected to represent them this May." Ms Chervakova says she has a message for Moscow if Russia decides against a boycott: "If Russia does take part, I'd ask the Russian delegation to come here without 'little green men' or the kind of props we see in the Donbas: heavy-calibre mortars." "Little green men" was the nickname given to soldiers in unmarked uniforms who seized Ukraine's key installations in Crimea in 2014, paving the way for Russian annexation. Why is Russia so desperate to win Eurovision?